Exotic options and structured products are two of the most popular financial products over the past ten years and will soon become very important to the emerging markets, especially China. This book first discusses the products' recent development in the world and provides comprehensive overview of the major products. The book also discusses the risks of issuing and buying such products as well as the techniques to price them and to assess the risks. Volatility is the most important factor in determining the return and risk. Therefore, significant part of the book's content discusses how we can measure the volatility by using local and stochastic volatility models — Heston Model and Dupire Model, the volatility surface, the term structure of volatility, variance swaps, and breakeven volatility. The book introduces a set of dimensions which can be used to describe structured products to help readers to classify them. It also describes the more commonly traded exotic options with details. 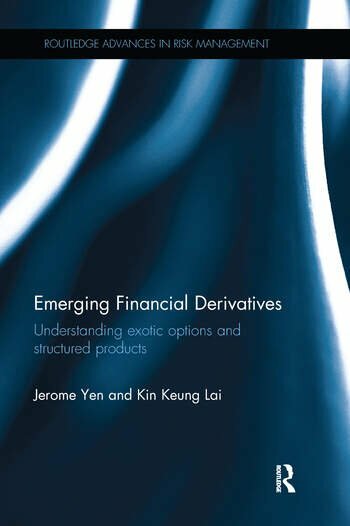 The book discusses key features of each exotic option which can be used to develop structured products and covers their pricing models and when to issue such products that contain such exotic options. This book contains several case studies about how to use the models or techniques to price and hedge risks. These case analyses are illuminating. Jerome Yen is currently a professor of the College of Business at Tung Wah College, Hong Kong and also a visiting professor in the Department of Finance at Hong Kong University of Science and Technology. He is also the director of HKUST’s Quantitative Finance program where over 70 percent of graduates went to investment banks like Goldman Sachs and Morgan Stanley. He received his Ph.D. in 1992 in Systems Engineering and Management Information Systems from the University of Arizona. Kin Keung Lai received his Ph.D. at Michigan State University, USA. He is currently the Chair Professor of Management Science at the City University of Hong Kong. He is also the Director of the Invesco-Great Wall Research Unit on Risk Analysis and Business Intelligence (RABI) at the College of Business. Prior to his current post, he was a Senior Operational Research Analyst for Cathay Pacific Airways and an Area Manager on Marketing Information Systems for Union Carbide Eastern.